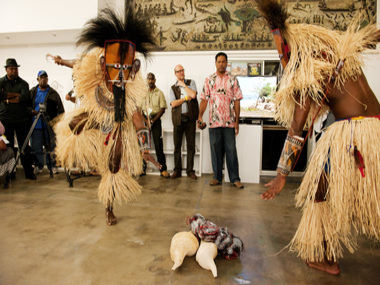 Get up close and personal with the art, dance, stories and traditions of the oldest continuous culture on Earth at Cairns Indigenous Art Fair 2012. The world’s premiere showcase of Queensland Aboriginal and Torres Strait Islander art and culture kicks off in style tonight at Cairns Cruise Liner Terminal. In its fourth year, Cairns Indigenous Art Fair offers 23 exhibitors showcasing more than 300 Queensland indigenous artists’ work over three days down on the waterfront. That's three more than in 2011 - Fireworks and Suzanne O'Connell Galleries have joined the party from Brisbane, and the Yarrabah Community Arts Centre is newly minted. With $1.8 million worth of art sold since 2009, CIAF is now one of the most recognised art events on the Australian calendar and sees visitors come to the region from all corners of the country and the globe. Some of the top end buyers are attracted by the generous Collectors and Philanthropy Program (by invitation only) which sees guests enjoying a customised weekend of talks, tours and introductions to artists and arts centres. Cairns Cruise Liner Terminal isn’t the only place hosting CIAF-related events, with a series of satellite venues across the city also taking part. For instance, the official exhibition, curated by CIAF artistic director Avril Quaill, is already on show over at Cairns Regional Gallery (with free entry from Friday-Sunday). 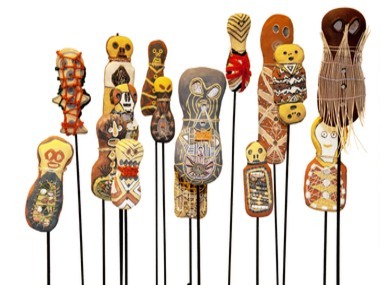 This exhibition presents new works that explore new art forms by Queensland Indigenous artists, including Vernon Ah Kee, Richard Bell, Michael Cook, Joanne Currie, Nephi Denham, Sally Gabori, Gordon Hookey, Craig Koomeeta, Glen Mackie, Justin Majid, Shirley Macnamara, Arone Meeks, Billy Missi, Abe Muriata, Rosella Namok, Laurie Nilsen, Leigh Namponan, Sharon Phineasa, Teho Ropeyarn, Zane Saunders, Ken Thaiday Snr, Ian Waldron and Judy Watson. Some familiar names there – but one will be a lot more familiar at the end of CIAF – Shirley Macnamara, For this Mt Isa weaver is also a speaker at the CIAF Symposium. The Centre Of Contemporary Arts hosts the Symposium from Friday-Saturday, featuring keynote speakers Destiny Deacon, Michael Reid, Shirley Macnamara, Jimi Bani and Aaron Fa’osa, discussing Where does the vision to innovate come from? What is the current state and future direction of the contemporary Indigenous arts market? Elsewhere, UMI Arts, KickArts and C.1907 Contemporary Artspace host a series of exhibitions from established and emerging artists. It all kicks off with tonight’s gala CIAF Opening Party at Cairns Cruise Liner Terminal, giving attendees an exclusive chance to view and buy artwork before the official opening tomorrow. There'll be performances from the Lockhart River Kawandji-Wimpa Dancers, Badu Island Traditional ZUGUBAL Dancers and Wawu Maumele (Know Your Heart), a performance including songs created in a combination of Miriam Mer, Kuku Yalanji and English, by the Briscoe Sisters and King Kadu, and backed by the Torres Strait Islands Choir. This premiere musical event was created especially for CIAF and is produced by local musical master Will Kepa. Undoubtedly the best opening party – tomorrow night – will be a Canopy Artspace – where four Queensland artists get to strut their stuff: Dennis Nona has New Visions in Lithography, Alick Tipoti is showing new linocuts, Arone Meeks has etchings and paintings and Ken Thaiday has crafted new sculptures. Finally, a special documentary film exploring the life, works and traditions of one of the Torres Strait’s most prominent artists will premiere at this year’s Cairns Indigenous Art Fair. Zugub, The Mask, The Spirits and The Stars travels to Badu Island, the home of Alick Tipoti and sees the internationally celebrated artist intimately describe his culture. He will also recall the legends of his land through dance, music and art.